Send 24 Pink Carnations and 16 Fererro Rocher to Chennai. Gifts to Chennai. Send Gift Hampers to Chennai. 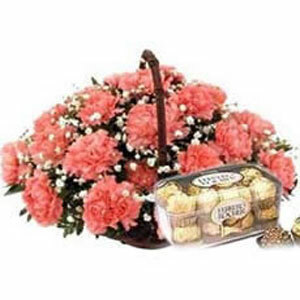 Description : [Site] offers Beautiful 24 pink Carnations arranged in a round basket with 16 Fererro Rocher Chocolates. Other Gifts to Chennai can also be added to make your loved ones day in Chennai more joyous.